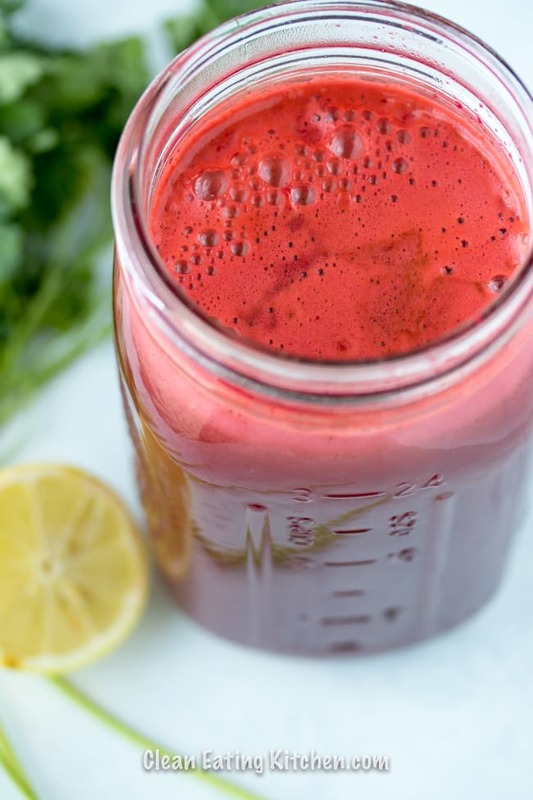 This Beet Juice recipe is a healthy and nourishing drink that supports detoxification and cleansing. It also happens to be absolutely delicious! 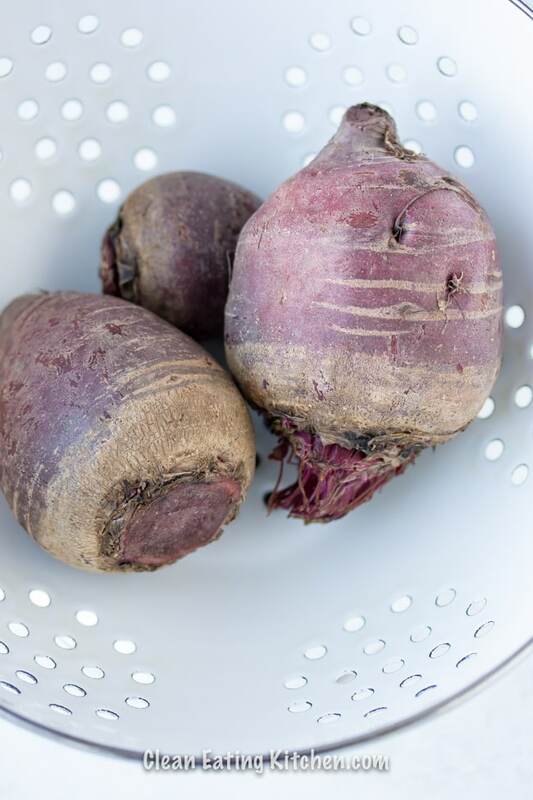 Beets are one of those vegetables that are underused, in my opinion. They can be consumed raw or cooked, and I think they have the most delicious, sweet flavor. Beets are perfect in a juice, too, because they are naturally sweet. Other ingredients that are amazing in beet juice are fresh ginger and cucumber. The first step for any homemade vegetable juice is to gather all of your ingredients. I like to wash and prep them ahead of time since that is the most time-consuming part of the whole process. Sometimes I will even prep my juice up to a couple of days before I actually make the juice. The next step in the game is having an easy-to-use juicer. I prefer a masticating version over a centrifugal type, but whatever you have is perfectly fine, as long as you are comfortable using it. You can also use a high-speed blender to make juice, but you’ll have to strain the pulp out if you use a blender. It’s also interesting to note that even using just one large beet will turn the juice red, no matter what other vegetables are included. Can I drink beet juice everyday? Yes, you can drink beet juice everyday as long as you don’t have any troublesome side effects, such as diarrhea. How long does it take for a glass of beet juice to lower blood pressure? Studies have shown that beet juice can have the effect of mildly lowering blood pressure about 4-5 hours after drinking it. 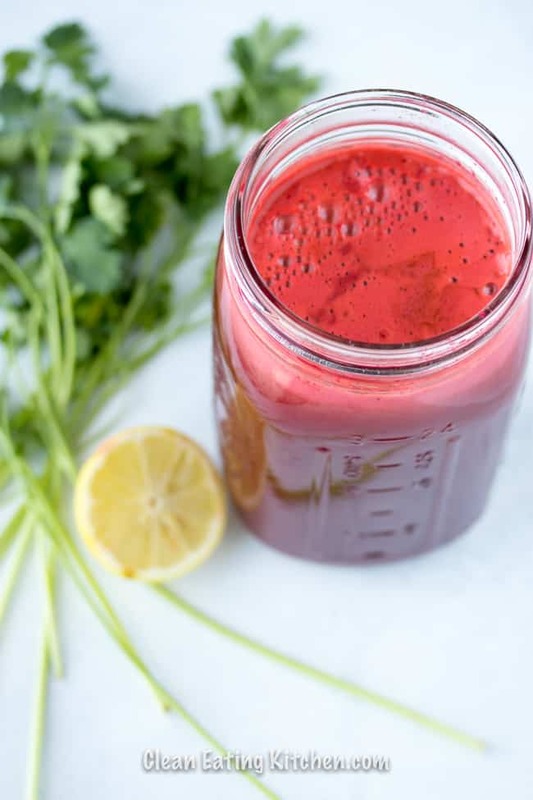 Most vegetable juices have the benefit of having a high antioxidant and vitamin content, especially when consumed immediately after making the juice. The benefit of juicing is that you don’t have to digest all of the fiber from the juice. Does beet juice make you poop? Beet juice can cause a bowel movement due to the fiber that is still in the juice. I’ve been asked a lot about juicing in general, so I thought I would answer them here. How did you get started with juicing, or what would be the first steps you’d suggest for someone beginning their juicing journey? Carrie: I started juicing to just get more nutrition into my diet. 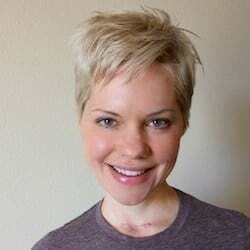 I’m a thyroid cancer survivor, so anything I can do to stay healthy is important to me. Since I’m a healthy food blogger, I mainly used the internet to learn the ins and outs of juicing. Is it more beneficial to juice before or after a workout? What is your number one recommended juice for the fitness enthusiast? Carrie: I prefer to juice before a workout along with a regular meal to provide energy, but juicing afterwards works, too. I like any kind of juice that includes lots of vegetables and isn’t too sweet. Juice cleanses are very popular right now, and for many people it can be a very daunting task. What are your thoughts on meal replacement juice cleanses versus juicing while eating a meal? Carrie: I like to have a juice with a meal, otherwise I often get a sugar rush, even from a vegetable juice. I’m not personally a fan of juice cleanses, although I think they can be great to meet the needs of people looking to lose weight or detox. Is it necessary to use organic produce when juicing? Carrie: I shop at a lot of farmers’ markets, so most of the produce I buy is pesticide-free, but not necessarily organic. I do recommend that people are familiar with the Dirty Dozen list of vegetables from the Environmental Working Group, and not consuming conventionally-raised items from that list. What are other creative ways to use juice? Carrie: Vegetable juices make great soup bases, and can also be added to smoothies for a meal replacement (just blend avocado with your fave juice for a super easy option). Carrie: It’s taken me some time to make juicing a part of my regular routine, but I sincerely believe it’s an excellent (and delicious) way to add more nutrients to one’s diet. There are so many combinations that can be made, so I encourage everyone to just experiment to find your favorites. Beet juice is a healthy and nourishing vegetable juice that supports detoxification and cleansing. It also happens to be absolutely delicious! Here’s how to make it at home. 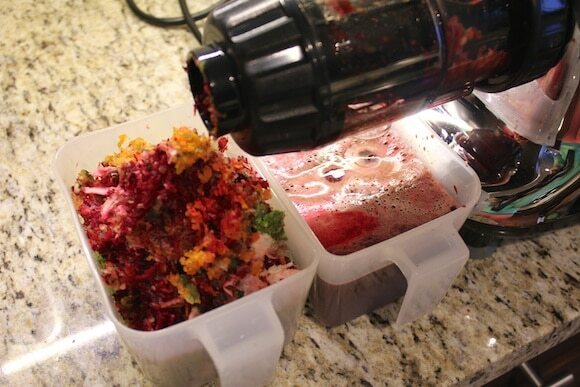 Wash produce and chop so pieces will fit into the feeder tube of your juicer. Feed the vegetable pieces through the juicer, alternating harder and softer textured pieces to aid in the juicing process. Serve immediately or store in the refrigerator in a highly-sealed container. The juice is best when served within 48 hours of making it. 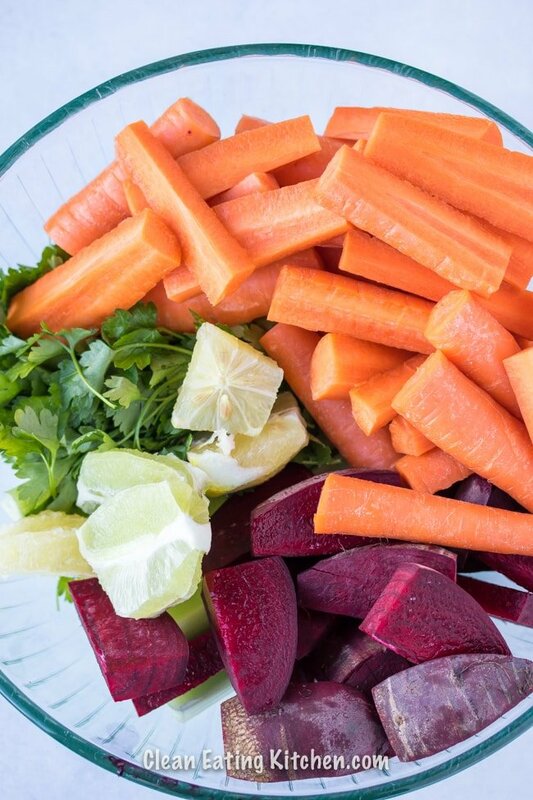 Be sure to pin this Beet Juice recipe to your favorite Pinterest board to save it for later! I LOVE juicing, I just haven’t done it in a while. It’s not as easy getting fresh produce here, I really need to move to Cali! Plus there is a plethora of new juice places here in Calgary, sometimes it’s just easier to buy it 😉 I tend to make more veggie based juices, nothing too sweet, so I do enjoy it a bit more when I make it myself. Gorgeous picture of the beet juice! Although I love juices, I just don’t think I can make the time or put in the effort for it. I don’t actually have a juicer. 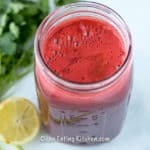 This is one of my all-time favorite juice recipes!